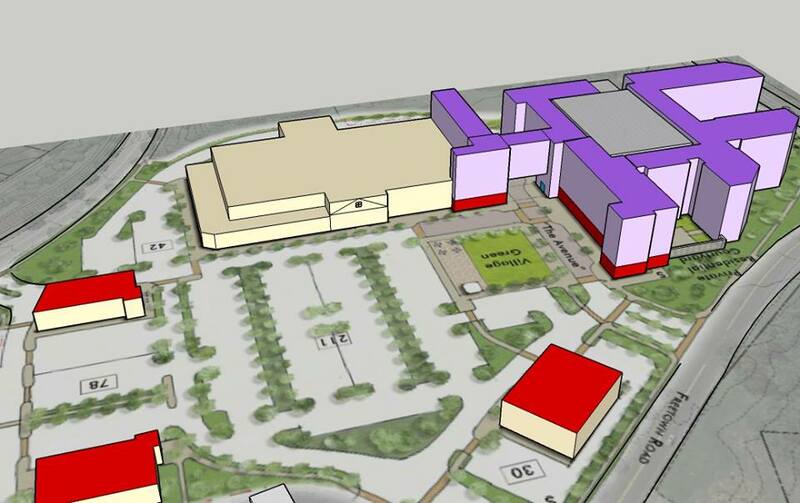 It is fascinating how this 3D sketch gives me a better understanding of the plan. To me, it dramatizes how the site for the community park is now cut off from the rest of the site. What if Kimco and Columbia Association arranged a land swap that enabled the apartment building to push back into the woods where the park was to be and allowed Columbia Association to create the park or some other public-use facility adjoining the Village Green? Zoning for village center – “Residential uses, to the extent appropriate to support and enhance, but not overwhelm, other uses in the village center”. Who makes the decision regarding whether or not the apartment building will overwhelm? Certainly it will with parking and traffic and will take away the feeling of a village center. Does Kimko make that decision? It’s obviously a judgement call, that’s going to have a lot of smart people contributing to the decision. Kimco will present their best argument that the apartments are secondary to the retail and public purposes of the Village Center. The HoCo Dept of Planning and Zoning will present their analysis to the Planning Board, and the County Council, acting as the Zoning Board, has final say. Traffic and parking will be a big part of the debate. And lot’s of opportunity for community input. Next Next post: Is good design being applied to new Downtown Columbia Development?